This entry was posted on November 21, 2009 at 6:25 AM and is filed under Military, Obama, politics. You can follow any responses to this entry through the RSS 2.0 feed. You can leave a response, or trackback from your own site. Obama is doing a horrible job and you have had the tremendous courage to not only tell him that but to tell him what he’s doing wrong and how to fix it. Thank you. Thank you, also for your years of service. Both of my grandpa’s served and I understand a little better than some how that can affect some one. I am not personally one to serve for various reasons, but I do respect and honor those who choose to serve and who have served in the past and to you and all of the others who are or have been involved in the service, I offer my thanks. I am a mere youngster of 83 years of age, served only two years in the Army, and fortunatly did not see combat. I was in the Philipines as the Paciific Theater operations came to a close, I saw enough at that time. to know what it means to have the backing of a strong Country behind you! I cannot find fault with any of the thoughts you so aptly expressed, Harold, and would like to thank you for bringing the points home to the many Americans who read them, and also to thank you for your service to Our Country! Hooray couldn’t have said it any better and it’s so true! People like Harold Estes should be President. Those who voted for Obama should realize the damaged our nation is undergoing. We need courageous people to stop this train wreck. How on earth did that man, Obama, fool so many people? They must have marched to his Pied Piper/Hitler charisma. Some of those voters are apparently now seeing through his campaign rhetoric — why did it take them so long! 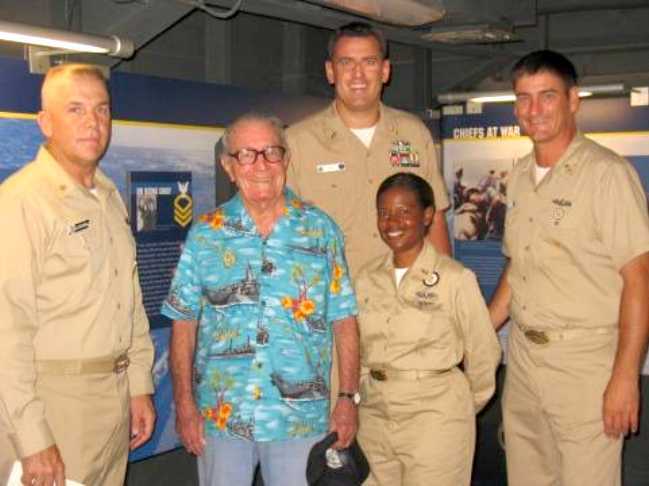 Thank goodness for people like our 95-year-old sailor who has served our country so well. This wonderful man very eloquently put in gracious words what out leader and his office need to do. When are they going to listen to the majority and not just fly by the seat of his pants. !I want my country to live and prosper. Right now, it’s falling in on itself. We need to stop this. We need to again become a caring power we once were. We need strong leaders, not wishy washy what can I do for me folks. It’s not too late for our president to turn things around, but he needs to get his head out of his non comunicating area and pay attention to us! Thank you. Boatswain Mate. Sideboys made fast on the Qt deck to Pipe you over, two.. Good job on that letter shipmate. I’ll send that letter to all shipmates I know. One Boatswain mate to another, live long Sir, which you have done so far, your doing it right. Al Clayton. “Boats” usn-ret. I feel exactly like Glenn Beck. This administration is being led by the number one mob boss from Chicago === Obama and his elite gang of czars who seem bent on taking advantage of our country’s most delicate and fragile time in its economic history. A time and these criminals are bribing our Senators into submission and threatening our very poklitical fiber. These corrupt and criminal bums especially Pelosi, Reed, Dobbs, Barney Frank, the Federal Reserve, and all the rest of this most Liberal and non conservative government we have ever elected, are determined to take down our American Democracy, Capitalism as we know it, and all our known liberties. So they can “Spread The Wealth” Opening the gates to a complete socialistic government and the complete control over all Americans! It has been said when there are 45 to 50% of the people of any government not working or paying taxes and the working have to pay, there will come a time when the Debt and corruption will proliferate as it is at it highest peak today. Right in front of America’s eyes with no real recourse available to us. Ovewelming any democratic society just as Greece and Rome fell so wil America. It is History repeating itself. It is here now in 2009! He is on the road to bankrupting America. Once he (Obama) passes “Healthcare Reform” as he calls it, the next thing he will do is give 30 million illlegals amnesty and we will also pay for these welfare recipiants. To no end. The fianl votes needed to keep this crook in power for another four years after this disaster he is running today. When will it end? When the Amercan people “UNITE” refuse to pay these taxes. That is our weapon and the only thing Washington will listen to. Just don’t pay taxes for one year and teach them who iare really the people, that hire and pay for all this nonsense. It is that simple! There would be about approximatley 90 million people not filing taxes or just filing late. What could thay do? mIt would be a real disastrer and send the ost profound message in our country’s history. Enough is enough! WE warned thes crooks now let us show them we can unite and send the first real message. Excepting for total anarchy (which may come first) this is the only thing these crooks will listen to. We have marchedon washington to sne dour elelted officials the message. We have basivcally “raised hell peacefully” and they still will just not listen to us the people. We have to do something before these crooks have their way. One day soon he will instill marshal law and take all our weapons to defend ourselves and then we will be S_ _ T out of luck. It is coming earlier than you think! Why do you think people are buying so much gold and guns. The dollar could callapse any day now. Obamam is making his world connetions now before he establishes a global currency. California has passed an ammunition law! WHY? Has anyone even raised the question? He: Obama, I think has been propped up by a socialistic system so well organized it has taken our country by storm and definatly by total surprise. Just as Hitler did in Germany with the dictatorship he forced on the GErman people so is Obama trying to do the same. In the almost same exact way (if you study eonomics and history) they did in 1934. Look what happened to Germany! Hyper inflation, devaluation of the mark, and a totoal breakdown of the government who had already been infiltrated with Hitler’s thugs. Check it out America! Read America. Watch GLenn beck! He has actaully layed it all out for us pointe to the crooks who are actaully doing this including all the SEUI and Accorn thugs and is the only real voice in America today that has the balls to do so. Wake up America before it is too late. It already may be the 11th and a half hour before the clock strikes twelve! Good job, Harold. I know many Americans feel the same way, we just don’t know how to put it into words like you did. Thank you for your service to this proud and great country of ours. I don’t want to see it die now either.